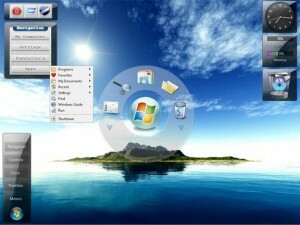 Do you want appearance or look n feel your Windows XP like Windows 7 desktop? You can install windows 7 transformation pack on your computer. At this time Windows 7 is available in beta version but almost on final release. There are lots of Windows 7 Transformation Pack for Windows XP on internet and almost everything is free. Appearance of Windows 7 desktop almost like Windows Vista but on Windows 7 there are some new features such aero shake, aero snap, new themes and more. Go to cursors folder in the extracted folder and rick click mouse in install.inf file and then select install. In the package available two file of boot screen, boot screen for Windows Vista and Windows XP. Install it. Copy all file in the sounds folder to /%system root%/media/ folder, and then setting up the sound from control panel. Install Styler software in the styles folder and then copy the skin to installed folder. Activate one off the skin. Run start menu in the start menu folder. Install user login screen file in logon screen folder. Available 12 Windows se7en’s wallpaper in wallpaper folder. Copy “Windows 7 M1 VS” folder in theme folder and then copy to /%system root/resources/themes, and activate the theme by right clicking mouse in the desktop and select appearance tab and select windows seven themes. Click apply. Run Vienna Explorer in the Vienna Explorer folder. Tips : to run this software run automatically when windows XP start, right click the software in the desktop and check “run automatically when windows start” and then click ok.
Run windows seven pie dock in pie dock folder. This software to beautify start button. Run the software. Not available in this package. You can search the icon in the internet.